Osteopathy is recognised by the British Medical Association as a discrete clinical discipline. It is the first complementary therapy to have undergone statutory regulation by Parliament. The name osteopath is now protected and it is an offence to practice as an osteopath without being a member of the General Osteopathic Council. This gives osteopaths similar status to a doctor or dentist and guarantees the patient the equivalent high level of protection. Only osteopaths able to show that they have been safe and competent are allowed on the Register of osteopaths, they all need to have medical malpractice insurance and follow a strict code of conduct. In the United Kingdom osteopaths currently, carry out an estimated seven million consultations every year for various conditions. 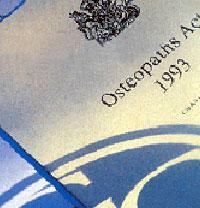 This is a 25% increase in demand since the introduction of statutory self-regulation for osteopaths in the 1990s. Currently, most osteopaths work on a self-employed basis in the private sector, out there is a growing tendency towards multi-disciplinary environments and integration with the National Health Service (NHS).